1. Exclusive VIP Tour for a minimum of two (2) guests and a maximum of twelve (12) guests. 2. Exclusive backstage tour whenever applicable. 3. Unlimited Universal Express® access to all attractions before or after guided tour. 4. Five (5) hour tour of Universal Studios Singapore®. Tours depart throughout the day, please enquire with VIP Tour Reservations for available timings. 5. Tours are available in English and Mandarin. Please check on the availability of other languages. 6. Reservations are required and must be made at least 48 hours in advance. To reserve your VIP Tour, please call (65) 65776077, email us at rwstours@rwsentosa.com. 7. Enjoy access of the USS VIP Lounge (daily from 12 noon to 6pm) throughout the year for World cardholders that buy the standard One-Day pass (non VIP Tour). 1. Tours are non-exclusive and will accommodate a minimum of two (2) guests and a maximum of twelve (12) guests. 2. Five (5) hour tour of Universal Studios Singapore®. Tours depart throughout the day, please enquire with VIP Tour Reservations for available timings. 3. Tours are available in English and Mandarin. Please check on the availability of other languages. 4. Reservations are required and must be made at least 48 hours in advance. To reserve your VIP Tour, please call (65) 65776077, email us at rwstours@rwsentosa.com. 1. Promo valid till 18 December 2015. 3. Discount is not applicable for Set Menus and alcoholic beverages. 4. Not valid on eve of Public Holidays and on Public Holidays. 5. Offers are not valid in conjunction with other discounts, offers, privileges and other promotions. 6. Payment must be settled in full by MasterCard credit/debit cards. 7. 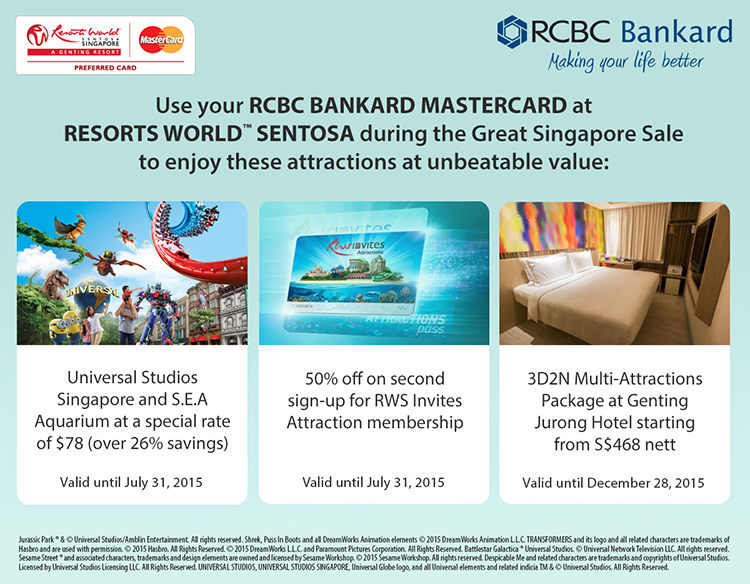 Resorts World Sentosa reserves the right to vary or amend any terms and conditions at any time without prior notice. 2. Minimum spend requirement is S$20. 3. Offers are not valid in conjunction with other discounts, offers, privileges and other promotions. 4. Balance payment by MasterCard credit/debit cards. 5. 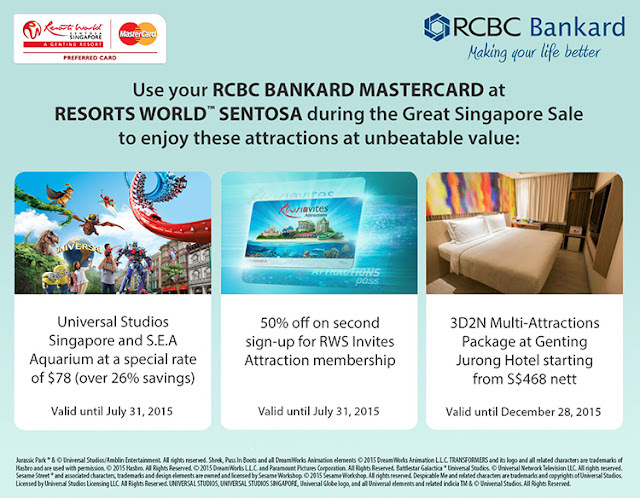 Resorts World Sentosa reserves the right to vary or amend any terms and conditions at any time without prior notice.